Sony recently announced its brand new ‘SF-G series TOUGH specification’ UHS-II SD card. They are 18x stronger than standard SD cards, drop-proof up to 5m, water-proof with an IPX8 rating, dust-proof with an IP6X rating, and even bend proof to 180N (which is 18-times stronger than the standard SD card bend proof rating of 10N). They're the world's toughest, according to Sony, thanks to a single-piece design (one-piece molding, no empty space in the card), instead of the typical three-piece construction. To eliminate moving parts that could let in water or dust, the SF-G Tough cards have no write protection switch and they are also the world’s first rib-less SD cards. They come in three sizes: 32GB, 64GB and 128GB, and each one offers fast write speeds of 299MB/s, and read speeds are even faster, 300MB/s. It is also important to note that the new Sony SF-G series TOUGH specification range also supports V90, the highest standard of video speed class, making it an ideal companion for shooting high resolution 4K video. 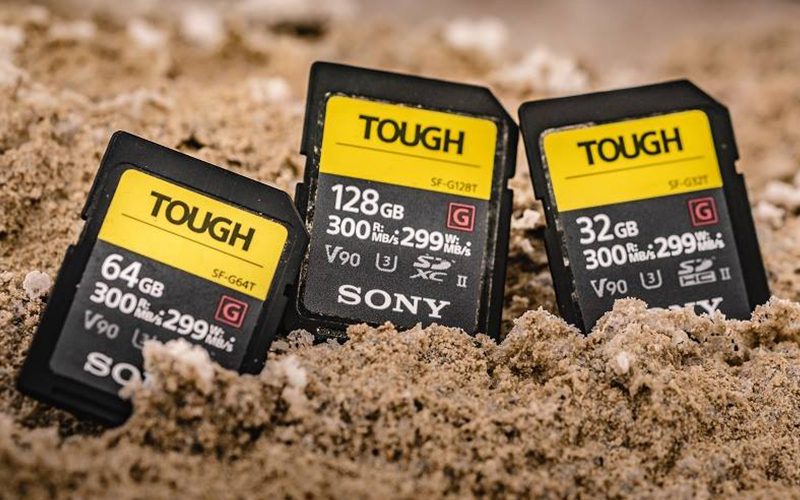 Unlike regular SD cards, the TOUGH range features a bright yellow design, which should make them easier to spot if dropped during a dark or muddy shoot. SF-G series TOUGH specification SD cards offer a series of further features, designed to give photographers peace of mind including an ‘SD Scan Utility’ which allows the user to check the condition of the card and File Rescue Software which can recover data and photos that might have accidentally been deleted. They are also X-ray proof, magnet proof, anti-static, temperature proof and feature UV Guard. The new TOUGH SD cards will be available later in October.